At the beginning of August we made a trip to the UK. Most of the time was spent in Scotland where I somehow got drawn into all things whisky. But since distillery and pub visits are not really compatible with a family vacation, most of my acquired whisky knowledge is still very theoretical. I started out with one bottle of malt, that I brought home to Dresden. Accompanied by a book on the topic of whisky. And while I am very interested in trying out a couple more brands in the future (see below! 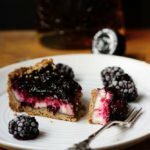 ), my mind immediately wandered off to the kitchen, where a huge bag of freshly picked blackberries was sitting in the freezer. Because the last time I baked something with booze it was super awesome. 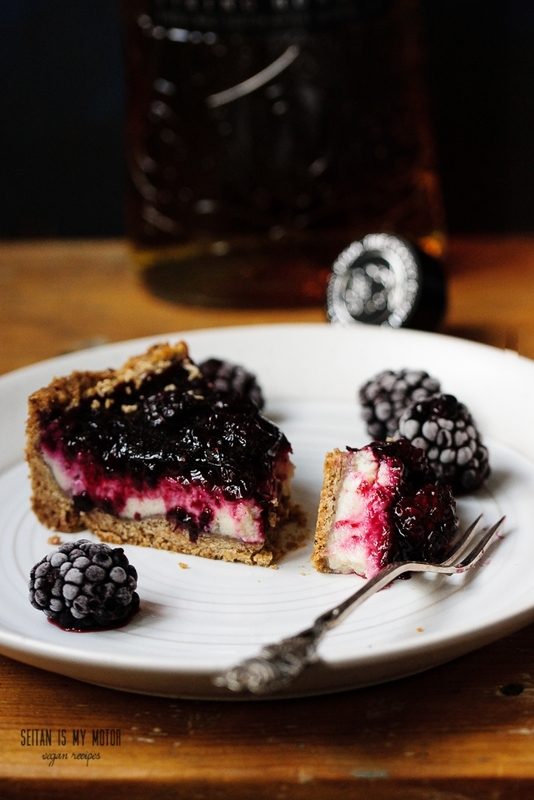 Of course this blackberry cheesecake doesn’t have to be made with single malt. 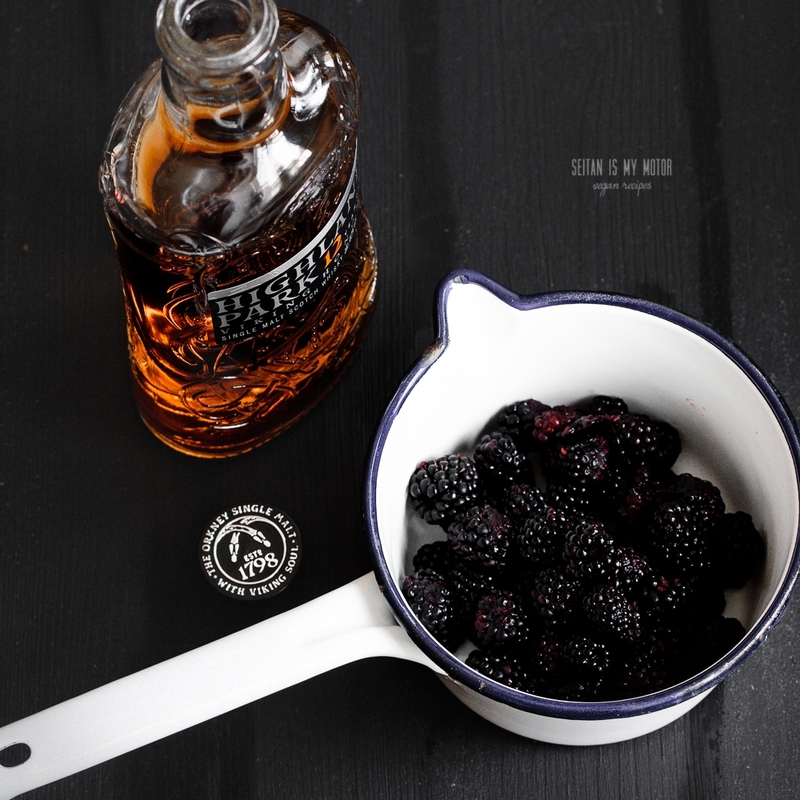 Bourbon will do the trick of enhancing the fruity aromas just as well. And so will do rum or a fruit based spirit. And even if you don’t have any alcohol on hand or simply don’t use it, that is fine, too. I will provide substitution suggestions in the recipe notes. If you’ve been following my recipes for some time, you probably already know that I never use cream cheese in my cheesecake recipes. It’s not that I don’t like it, it’s just that it has never been readily available in Germany. And now that it is, it is mostly manufactured by large dairy companies, which for me doesn’t really do the trick. So I still stick with yoghurt for my cheesecake base. For this version I also had to use up a box of store-bought cashew single cream. These kind of vegan creams are very common in Germany and several other European countries. From what I know they are not so common in the US. (They are usually thicker than creamer.) So if you don’t have a single cream on hand, you can make your own cashew based version. I like Gena’s basic recipe. By the way if you are of the whisky drinking kind, please leave me a comment telling me of your favourite single malt. I want to buy a bottle or two, but can’t really decide which one. Vegan cheesecake recipes are legion. 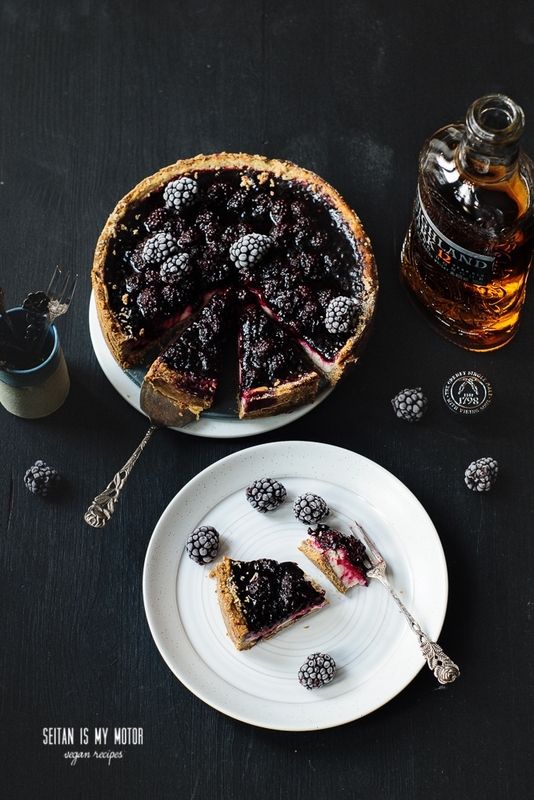 This one stands out with the help of some whisky and freshly picked blackberries. And you won't actually need any cream cheese. Just Yoghurt and some cashew based cream. Preheat the oven to 180°C and line a springform pan (20 cm diameter) with parchment paper or grease the pan. Place the walnuts in a food processor and grind into a fine meal. Add sugar, flour, and salt and pulse until combined. Add coconut oil and blend until the dough holds together. Now knead in the whisky. Press dough into bottom and sides of the pan and place in the fridge. To prepare the filling, place all ingredients in a blender and process until smooth. Remove the prepared springform pan from fridge and pour filling into the crust. Bake for 70 minutes or until filling is golden brown and has set. 10 minutes before you remove the cake from the oven prepare the topping: Place all ingredients in a small saucepan and cook over high heat for five minutes, stirring constantly. Set aside and let cool for another five minutes. Remove the cake from the oven and spread topping on top. Let cool to room temperature and then let the cake set in the fridge for 3-4 hours before serving.